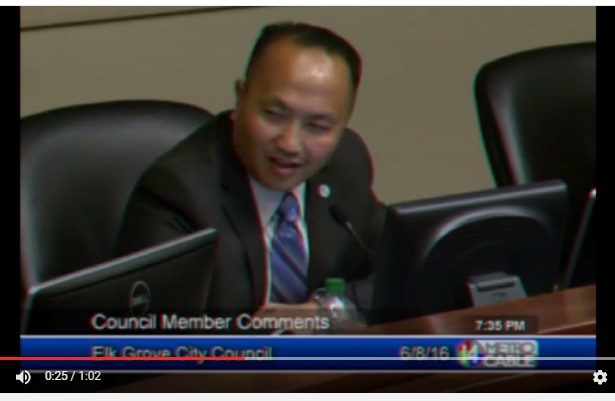 It happened so subtly, but those attending or watching the June 8, 2016 Elk Grove City Council might have missed a 100-year old city resident being insulted from the dais. The insult came from Elk Grove's internationally known Vice Mayor, Steve Ly. The internationally acclaimed jet-setting politician made the insult during the council member comments portion of the meeting. Ly's entire comments and Councilmen Steve Detrick's rebuttal can be viewed below. We found Ly's report on the interactions he had with the 100-year old resident to be flippant and inappropriate. Thankfully, Ly did not mention the name of the recipient lest she be further humiliated. So Vice Mayor Ly, if you were presenting the Key to the City to a dignitary from one of the diplomatic high rollers you claim to roll with, would you be so dismissive? If you answered a question about the significance of presenting a Key to the City in such a manner to the late General Vang Pao, would you have been so flippant? Mr. Ly, this type of behavior is not only condescending to the 100-year old lady, you are an insult to everything the good people of Elk Grove stand for. Time to get your ducks in a row Vice Mayor Ly or you might need that get out of jail card day someday. What we need is a leader, not a Monopoly player with a lousy sense of humor. This video confirms that Mr. Ly is nothing more than a narcissists. Beyond that, it is astounding Mr. Ly never learned from his family or the teachers that he praises to respect his elders. We got ourselves a real live Bob Hope here! Just my opinion, but that didn't seem rude.... a Monopoly joke? Come on! THEN WE HAVE SOCIAL LANDMARKS, Aids, Crack Cocaine, Great Depression, Civil Rights. Women's rights, women in factories stock market crash both of them, saw the first man on the moon two prohibitions, and countless vice-mayors of city council. I have no doubt she will outlive his career just as he's overstayed his welcome. Hopefully that key unlocks the place where his manners are kept.